Don’t Ignore the Local Races! The “American Ninja Warrior” obstacle at Ohio’s Mud Ninja is just one example of how awesome local races can be! As I’ve mentioned a few times, I just ran my first Spartan Race a couple weekends ago and loved it a lot. It was well-run, tough but not impossible, surrounded by great people, and more. Spartan is obviously one of the big three or four races that go on around the country each year (along with Tough Mudder, Battlefrog, and maybe Warrior Dash), and they’re all special in their own ways. But… there are a ton of local races that exist that people should keep an eye out for. They’ll give you a great challenge, treat you to a good time, and frequently even be a fund raiser for a charity that you care about. Obstacle Racing Media – while ORM doesn’t have a race look-up guide per se, it does have a page with a ton of discount codes for various races and OCR products that will give you a good idea of some of the races out there that may not have national attention. Active.com – not a definitive source of race information for the OCR fan, but they do list a few. Let’s break these up into a couple of categories: regional races and single-run races. There are a bunch of races that go on around the country that have not spread as wide as the big ones that are very high quality but just don’t have the national reach that others do. They have passionate followings and can be really well run, but either they tried to expand and didn’t make it, decided to stop with the reach that they did have, or are just starting up and are trying to spread out. Who doesn’t want an axe as a prize, right? With races in Ohio, Chicago, Pennsylvania, Maryland, Florida, Texas, and Georgia, Savage Race is a really well run operation that is just taking things slowly. I ran this one in 2013 (but haven’t since then as it coincides with my wife’s birthday weekend! ), and loved it. At the time, I sort of likened it to Tough Mudder but shorter. Many, if not most, of the obstacles were similar if not outright the same. That’s changed as the races have evolved, but there’s still some similarity there if not quite as much as there was. But this race was fantastic. Ours was held on a ski slope (yes, we have ski resorts in Ohio, believe it or not), so the race organizers had the lodge to use and lots of hills to throw at competitors. It was tough, no doubt. We were fortunate to be there on a great day, so the weather was nice, but it was a haul – up and down the ski slopes with obstacles more or less at the tops and bottoms of the various runs. It was about six miles, and Savage Race aims for a distance of 5 to 7 miles. There is a pro division with cash prizes, as well as a kids’ race, and the awards for the top finishers are axes. That’s pretty cool. The festival area was well set up, the ability to get to various obstacles for spectators was pretty good (though trudging up some of those hills was just as tough for spectators as it was for competitors on Ohio’s ski slope), and the post-race libations were flowing. Definitely one to watch out for. This race was created by a former American Gladiator (Dan “Nitro” Clark, if you’re a fan) and is run strictly out in California. But it has a passionate following and high reputation for its great quality and fun time. They’re a fund raiser for the charity “Talk About Curing Autism” which makes them a favorite in my book, for sure – definitely a bucket-list race for me. They have the distinction of being voted the Best Mud Run by MudRunGuide.com back in 2014. A second Navy SEAL-created race (along with Battlefrog), this race holds on to its patriotic Navy heritage pretty fiercely. With races up and down the East Coast from New England to Florida, this is a tough one – 9-12 miles with 30-some obstacles that are taken right out of the SEALs training manuals. They also have Navy SEAL demonstrations, a great family atmosphere, and a ton of fun after the race in the festival area. Pro racing legends like Junyong Pak and Amelia Boone list Bonefrog as being among their favorites – definitely high praise! These are the races that are local and only have one or two events throughout the year, but they frequently have quirks and special characteristics about them that make them special and keep people coming back year after year. Following the Facebook page of racer Kevin Laplatney let me know about this race. Run in New Jersey twice a year (well, they have two listed for 2016, any way), this race has an interesting twist to it: it has three course “levels of difficulty.” Completing obstacles gives you a number of points: level one gives you one point, level two gives you three, and level three gives you five. That, combined with your finishing time, shows the winner of the race (they have individual and team competitions). The race is a non profit to support charity:water. Definitely a noble cause. I’d be very remiss without mentioning one of my favorite races. The Mud Ninja is a crazy, messed up mud slog in central Ohio that I have taken part in every year of its existence. Part of that reason is that it’s a charity fund raiser for Autism Speaks, but primarily I go because it’s a blast. The Mud Ninja and I at the Walk Now for Autism Speaks. The race director/creator, Marty Parker, is a bit of a character – and takes an active part in the race’s creation and promotion. 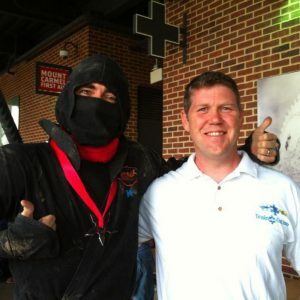 I ran into him a number of years ago at the Walk Now For Autism Speaks in Columbus, and he was done up in full Mud Ninja gear. He takes a hand at announcing during the race, is seen pretty much all over the course as he checks out the progress of the day, and is absolutely passionate about the success of this event. I have a special memory of his coming upon my muddy-from-head-to-foot self during the race one year and his laughing hilariously at me (till I gave him a hug, that is). The Mud Ninja is fantastic and tough. It starts on a plateau, basically, and the race starts going down one side of the plateau, with plenty of obstacles all over the place, and then back up to a twelve foot wall (with the Autism Speaks logo on it). Last year it added four consecutive grip obstacles (including the American Ninja Warrior pictured above) at the top. Then it goes back down the other side of the plateau, and back up to finish the race with a series of slippery mud pits. It specializes, naturally, in mud. Literally half the obstacles are mud pits of some kind and require a ton of teamwork and camaraderie to overcome. Literally. You can’t get out of some of them without help. And you’ll get the help – the people at Mud Ninja are just that friendly. You will see people who are muddy absolutely from head to toe – much more than even during non-Mud Ninja events. It’s a test for everyone, but everyone always has a good time with it. I’ve run it in a team and individually – it’s fun either way. It’s also got a fantastic kids race, and has awards for top finishers in the age groups and overall (yes, they give away ninja swords – and the medals are actual ninja stars as you can see in the picture of the Mud Ninja above). Everyone has a good time at Mud Ninja, I guarantee you. So remember that though Spartan, Tough Mudder, Battlefrog, and Warrior Dash have plenty of races all over the country, that there are other race series and events that you can take part in that are helping local and national charities, fund-raisers for various park services or other municipalities, and more. Check out those links at the top of the page to find the ones in your area! How about you? What local races have you run? Share with us on the message board!